- Over 230 exciting levels, with something for everyone! "Regular" levels to help beginners learn the ropes, "Advanced" levels for the brainy among us, and even "Kids" and "Alphabet" levels for the young in years, or the young at heart! - A full featured level editor! If solving puzzles isn't enough for you, make your own masterpiece with the easy-to-use level editor! - Exciting unlockables! As you solve puzzles you'll earn photos to add to the professor's gallery. You'll see the professor and his Friend-Bots in photos from all over the world! Professor Fizzwizzle has something for everyone to enjoy; download it for FREE, today! Professor Fizzwizzle is one of my favorite puzzle games. Professor Fizzwizzle is a brilliant, diminutive scientist in game. You take control of him to outmaneuver Rage-Bots or the environment to get to his goal. Along the way, you'll employ boxes, barrels, magnets, freeze guns and other devices to manipulate his environments and forge a path home. 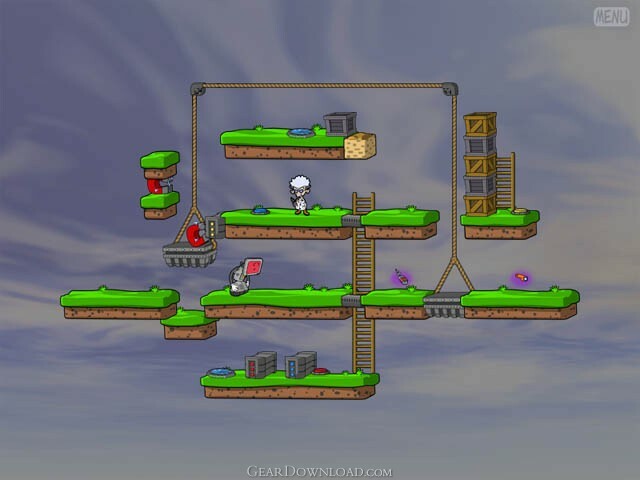 Fizzwizzle has four different level paths for gamers to explore. The "kids" and "alphabet" levels are for youngers, the "regular" levels are for grown-ups, and the "advanced" levels are a good challenge for seasoned puzzle veteran. If you are stuck on a level, you can simply ask the game to show you the solution anytime! If solving puzzles isn't enough for you, try out the full featured level editor to create your own masterpiece! You can post your levels on the game publisher's site for others or download levels posted by other gamers. This download (ProfessorFizzwizzleDEMO.exe) was tested thoroughly and was found 100% clean. Click "Report Spyware" link on the top if you found this software contains any form of malware, including but not limited to: spyware, viruses, trojans and backdoors. Chatterblox Deluxe 1.4 - Chatterblox is an exciting and addictive action/word game. Pinao 1.11 - Pinao is an extremely addictive variation of the famous Lines game. Joes Farm 1.3 - Sokoban goes rural. Shifty 1.0 - Here is a computerized tile shiftying program that you can load you oen pics in. ClickPuzzle 3.24 - ClickPuzzle is arcade-style puzzle game for Windows. Jezzball Deluxe 1.5 - This is a totally new kind of a remake of the popular Jezzball/Xonix game. CellFighter Game 2.5 - You are not crazy: colored circlets really became alive - repulse their attack!